QR Codes are extensively being used in the West for both operational and marketing use cases. In China as well as South East Asia, these square-shaped codes have become quite the rage. Statistics show that QR Codes are being widely used across the globe. And another region is rapidly adopting the technology—The Middle East. It is primarily driven by city administrations, government bodies, and large private brands. These QR Codes, when scanned, showed the exact location on a map. They show road directions. And they even provide details about the historical background of the area to explain naming of the street. This new addressing system will confer 66,000 building numbers, 6,600 street names and 17,000 street name signs in Abu Dhabi alone. 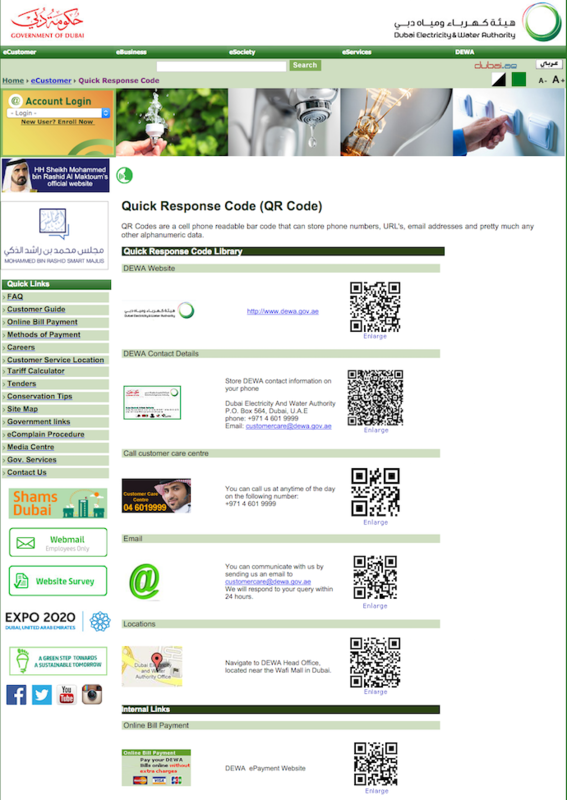 The Government of Dubai is using QR Codes on its Dubai Electricity and Water Authority website. They aim to make it simple for website visitors to save contact details, customer care number, email ID, and address on their smartphones. Using these QR Codes, visitors can also use their phones to make online payments, suggestions, and complaints easily. In 2014, the Dubai Islamic Affairs and Charitable Activities Department (IACAD) started the Smart Mosque Initiative by placing QR Codes in nine mosques. 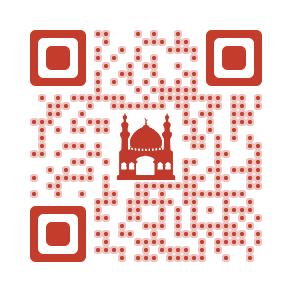 On scanning the QR Codes, worshipers can get access to the mosques’ information. This information includes such as history, construction, category of the mosque. And even e-services such as donations, suggestions, complaints and faults reporting. Also see how QR Codes are used in Saudi Arabia. As reported in 2014, Ali Alghanim & Sons Automotive, the exclusive importer of BMW, MINI, Rolls-Royce, Land Rover and McLaren, became the first automotive dealership in Kuwait to offer valet parking services through a partnership with Parking Pal, a valet parking service provider. Scanning a QR Code is one of the ways, car owners can request valet parking. We are happy to be working together with Ali Alghanim & Sons Automotive in providing the best valet parking service. Using the latest technology, which includes the auto request via text messages or IVR system or the scanning the QR code, we are truly proud of this collaboration. Because we always strive to improve our services and exceed the expectations of our valued customers. In 2014, Vodafone launched a virtual store Scan&Go where customers can shop for smartphones, subscribe to prepaid and postpaid plans, add credit to prepaid numbers, or get international calling or data cards simply by scanning QR Codes placed on walls of the store. Even if our shops are closed or even if customers are not physically present inside our stores, they can still enjoy retail convenience. With Scan&Go, we’re open even when we’re closed. Further, we can convert a bus stop into a virtual store or project these virtual stores onto walls. Even on the great pyramids of Giza, on top of a skyscraper, or in the middle of the desert. 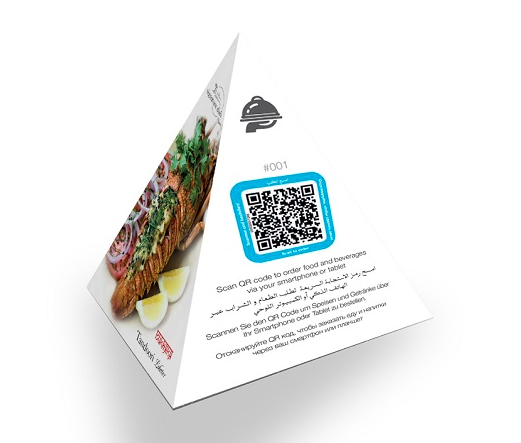 In 2015, Kempinski Hotel, Ajman used a QR Code on ‘unique pyramids’ in guestrooms to allow guests to easily order food. On scanning this QR Code, a food and beverage menu opens. Also, it is worth mentioning that the menu is available in four languages: English, German, Arabic and Russian. The highlight is definitely the speed of ordering. The moment you place your order, it is in the system and it directly forwards your order to the kitchen. It’s the ease of ordering and the quickness of delivery that makes everything hassle-free. On Jun 15, 2015, Turkish Banking Institution, Credit Reference Bureau (CRB) (Kredi Kayıt Bürosu), and the Turkish Union of Chambers and Commodity Exchanges jointly introduced a QR Code system for cheques. This system allows cheque holders review data on the credibility of the cheque issuer. The use of ‘Findeks’ application on their smart phones helps achieve this. The objective behind this system was to provide transparency and to minimize cases of cheque fraud. In 2013, Turkish financial Institution Isbank, partnered with French-based technology company Ingenico. 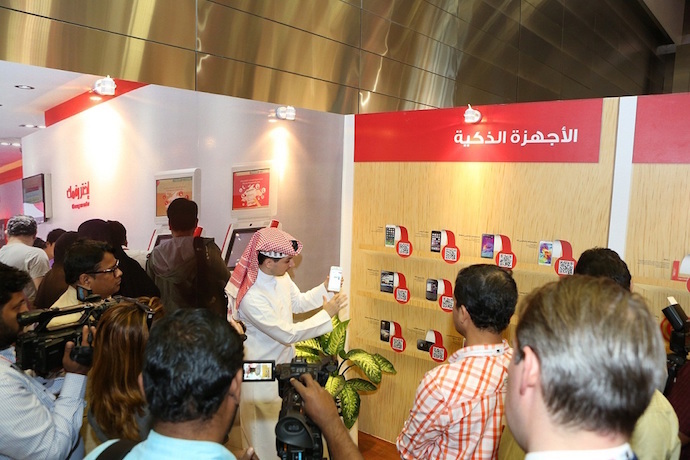 They launched the Parakod app that allows mobile payments using QR Codes at the point of sale. No need of using credit cards. See how Bank Islam Brunei Darussalam (BIBD) is providing payments services to businesses and consumers. In 2013, McDonald’s collaborated with Kuwait International Bank. Together, they ran a pilot with Seamless’ SEQR that allows mobile payments via QR Codes or NFC. As per NFC World report, Kuwait International bank is the first financial institution in the Middle East to test the solution. 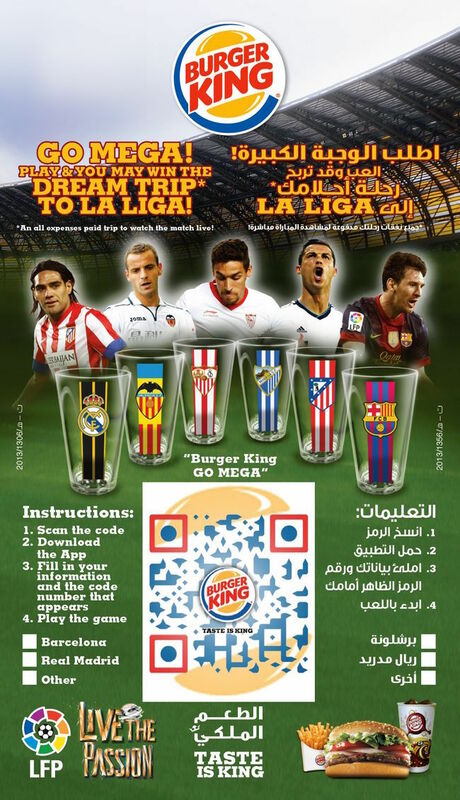 In 2013, Burger King (Kuwait) used a designer QR Code on Burger King boxes that launched an online game – ‘Go Mega’. Go Mega is a shootout style soccer game for mobiles. Players automatically enter in a contest by making a profile and entering a code on the box. Top three scorers got two tickets to Spain to watch a Spanish Soccer League (LaLiga) match in Barcelona. Bahrain’s eGovernment has made it easier for their website visitors to save contact details just by scanning a QR Code on the eGovernment Authority portal. The portal is a one-stop shop to facilitate the utilization and access of various government services available electronically. Examples above show that Middle East is using QR Codes across various industries. Hence, one can say that Government institutions and private players have adopted QR Codes for various use cases. Some of these are tourism, marketing, and security use cases. These campaigns are likely to create awareness of the technology amongst the population in the region. Also, brands should now consider adding QR Codes to their print media marketing campaigns. As a result, they’ll be able to engage consumers in the region. If you are a marketer looking forwards to run marketing campaigns in the Middle East, QR Codes are your way to go!